Nolan’s Gotham is ruled by fear and corruption, and the only way to change the situation is deep structural change. But that change can’t come by philanthropy or the actions of well-meaning rich people – as Nolan shows in Begins, those efforts are doomed to failure. Genuine change requires ordinary people to reject their fear, and Batman is there to offer an assist. For Nolan’s Bruce Wayne, Batman is a tool to inspire Gotham’s populace to better things, not an identity. The story of The Dark Knight, in particular, revolves around Bruce Wayne’s attempt to bolster a legitimate crusader – Harvey Dent – and relinquish his role as Batman. 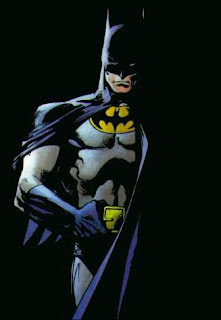 Obviously, with so much history behind the character, there is no “right” depiction of Batman. But for my part, I think Nolan has it best. The “crazy” view of Batman is interesting, but it misses the point. At base, Batman wants to save Gotham from its worst qualities, and that’s only possible if he has purpose beyond simple retribution – an insane or pathological Batman becomes a vigilante in the truest sense, more akin to violent figures like The Punisher or Rorschach than a traditional superhero. Unfortunately, Bouie's post also highlights the great flaw with all superhero narratives. You have heroes who want to save or redeem society. That's a desire that resonates with all do-gooders, great and small. At a high enough level of abstraction, the X-Men and the NAACP are the same organization. These people are fantastical but their moral imperatives are also recognizable. But who, then, are the villains? Invariably, comic books and superhero movies opt to pit their heroes against some loony criminal or megalomaniacal crackpot. But the RGA aside, real life doesn't contain powerful individuals or fraternities dedicated to eroding American society for no discernible reason. There's nothing recognizable about comic-book villains. It rings false, because on some level, most people realize you can't fix the world by rooting out the bad apples. And that remains true no matter how bad you make the apples. The villains hold comic-book storytelling back. The villains make the heroes silly. When Batman tries to inspire Gotham to fight corruption, it works, because he's the fantasy solution to a real-world problem. When Spider-man tries to save New York from a man dressed as a goblin on a hoverboard, it's just stupid: he's the fantasy solution to a fantasy problem. And the more time movies and comic books spend delving into the minutiae of their villains' origins or abilities or motives, the worse it gets. The story wanders into something of a narrative blind alley and loses any resonance for anyone not already invested in the characters. Until someone really bites the bullet and makes a superhero movie without a villain, it's hard to see how they can evolve far past being simple urban fables or superpowered soap operas. The more successful stories have been able to circumvent this problem to some extent. Someone like the Joker is more a stand-in for the forces of nature than a bad apple in his own right. It's still far from perfect, though: the solution is still "catch the bad guy and put him in jail." I also thought that the Iron Man movies would address this oversight. The reason that Tony Stark becomes Iron Man in the first place is to atone for his role as a weapons manufacturer. Not only does this raise some interesting philosophical questions (can Stark prevent wars and violence by building better weapons? Is Pax Ferrana possble, or desirable?) it also pits Iron Man against socio-structural problems instead of individual villains. In a sense, Iron Man is up against the economic and social forces that lead to violence, and the network of institutions that facilitate violence. It would be interesting to see Stark try to solve these problems -- or alternatively, try to knock off a succession of villains and dictators before rejecting the Great Man theory of history and accepting that society-wide ills have roots that reach beyond any set of individuals. But for some reason, the movies shy away from this, giving Stark plenty of robotic opponents to beat up. We'll probably never get to watch Iron Man campaign against nationalism or bridge sectarian divides. The Batman movies are surprisingly good at integrating Batman's small-bore problems with Gotham's urban failures. The arc of the first movie was about whether Gotham could be saved or should be destroyed; Bruce Wayne's dad was a reformer who built infrastructure and tried to revitalize the city. A disproportionate number of Batman scenes are set in government buildings, judges' chambers, City Hall and the like. The movies do a fantastic job of reminding the viewer that Batman is a rogue element in a long-standing system, and for much of the running time, the system itself is very much in the foreground. On the other hand, the Batman movies are nothing if not overloaded with zany villains. Every movie has included at least two. And we're moving in the wrong direction: it sounds like the next movie will include even more. As the focus increases on musclebound super-antagonists like Bane, the institutional disaster that is Gotham necessarily fades out of sight. In other words, it might be a while before might be a while before anyone gets this right. We're still getting the wacky cartoon heroes we want, not the heroes we need. The administration gets Solyndr0wned. Or not.